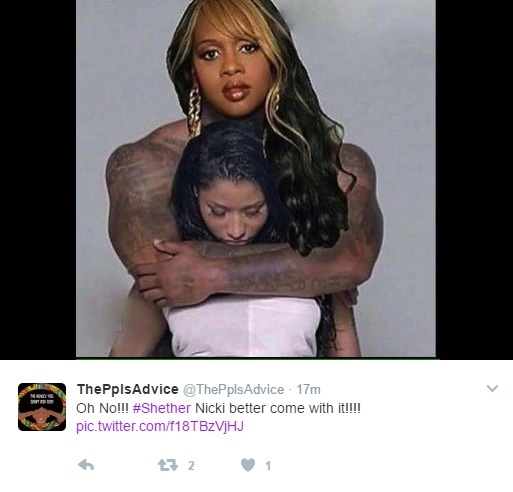 So, the verdict is out, fans have been taking sides and it looks like Remy Ma is winning with thousands of hilarious memes on social media shaming Nicki. So far, there are over 2,000 #ShETHER hashtags on twitter and 1,000s more on Instagram – lots more being continously added. So many good ones, hard to choose but here are some of the best, Enjoy! Uncategorized Hot tea to end a glorious Saturday: the best of Remy Ma vs Nicki Minaj memes Bookmark the permalink. ← Ahn Ahn! Wetin Nicki Minaj do Remy Ma to release a diss track?